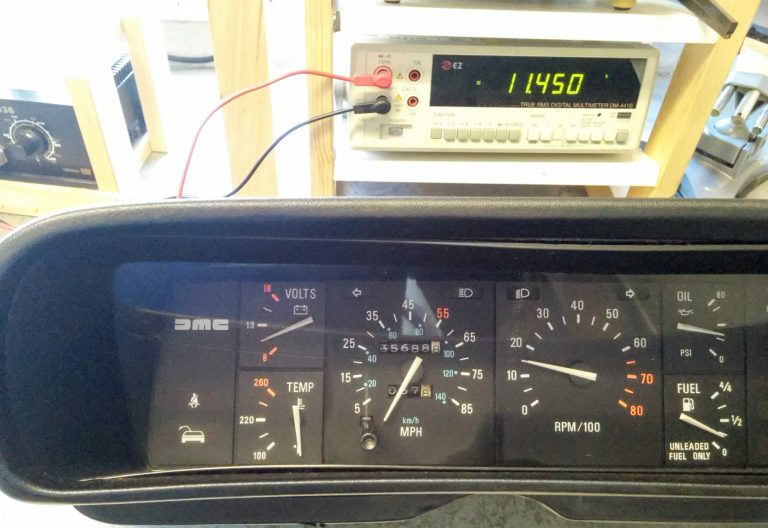 While trying once again to make my DeLorean’s voltage gauge more accurate, I decided to just jump to the very end – the actual gauge itself. At this point it’s the most likely component to be dodgy, but the wires leading up to it & the final connections to it could still haven’t been checked & cleaned, so I’ll tackle them too while I’m at it. One thing about DeLoreans, though – the easiest way to remove the dash’s instrument cluster is to just remove the entire binnacle… so that’s exactly what I did! 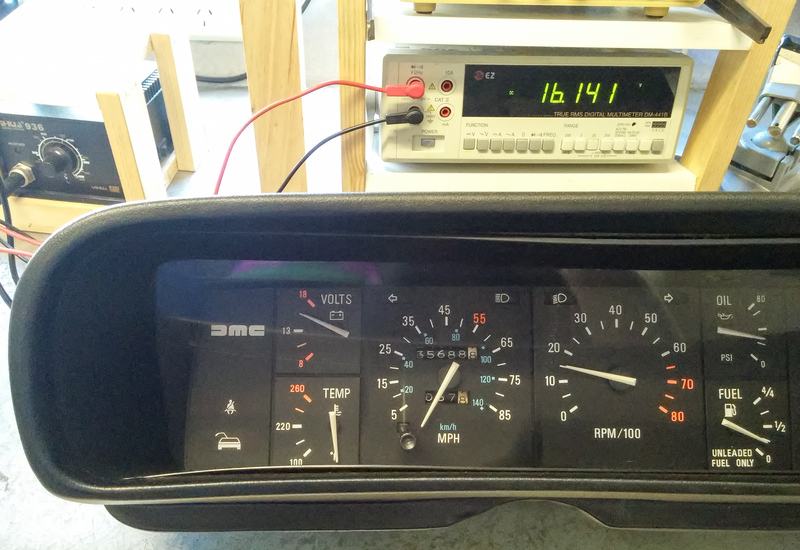 My DeLorean’s binnacle/dash instrument cluster sitting on the Electronics bench, hooked up to a power supply & multimeter. Time to get serious! 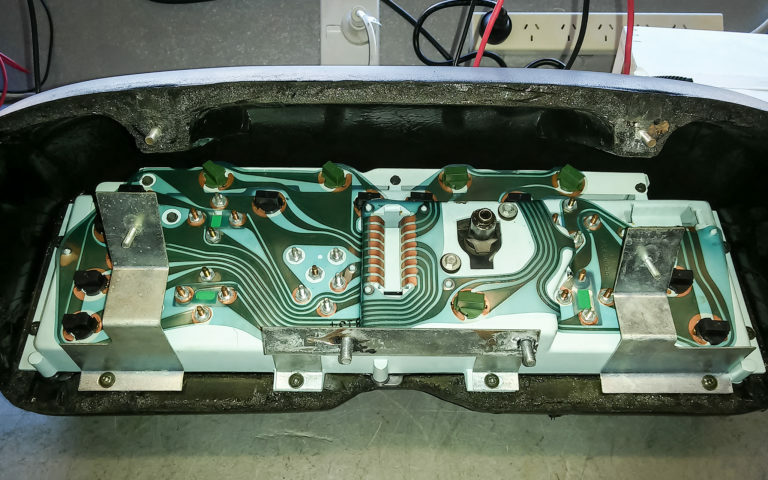 The dash instrument cluster on a DeLorean has a rather old-fashioned flexible plastic circuit board with mechanical connectors. This circuit board is incredibly fragile and should always be handled with great care, as the copper traces are thin & come loose from the plastic very easily. Thankfully mine’s in almost-perfect condition. I attached the probes from our power supply straight to the threads of the voltage gauge – this bypasses absolutely everything and will give me the purest voltage reading possible. 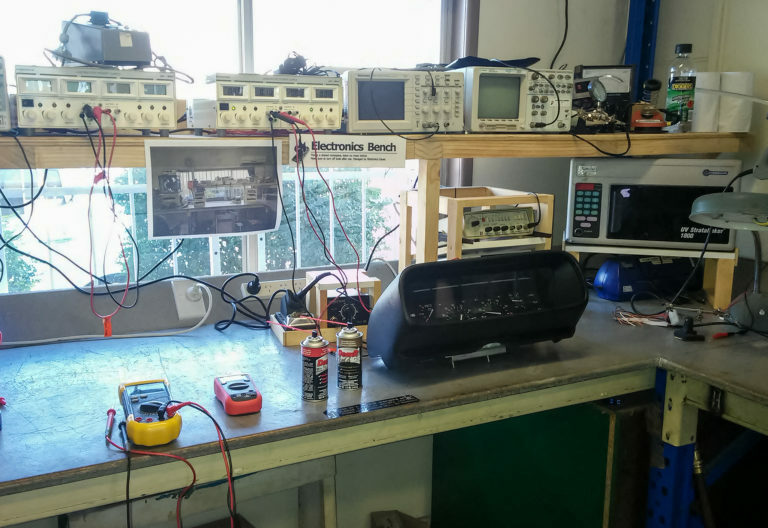 And just to be extra-sure, I didn’t rely on the voltage gauge of our power supply for the reference – I used one of our most accurate multimeters, an EZ Digital DM441B, which was also attached to the threads of the voltage gauge. Under these conditions this multimeter promises at least 0.1% accuracy to 4 digits, which should be good enough for around 0.01V. As expected, there was a slight voltage disagreement between the power supply and the multimeter, which is why I set it up this way because I trust the multimeter’s reading far more than I trust the power supply. So I attached everything, turned it all on, set everything to the right levels, aaaaand…. It turns out my voltage meter itself is reading incorrectly! It’s incredibly non-linear too – the amount it’s off by varies up & down over the whole gauge, between 0.2V to 4.5V, in a very up-and-down polynomial curve. Something way too varied for me to simplify to a simple thing I could keep in the back of my head – in fact the only consistent thing is that it’s always under by at least 0.2V. The good news though is that what the gauge currently displays as around “13.2V” is actually around 14V, so I now know this is pretty much the sole reason why it’s reading low. I took a whole bunch of photos of the needle at different points for future reference – I won’t bore you by uploading all of them but here’s two showing how much it varies. So, where to from here? Well it isn’t really possible to disassemble & recalibrate this part – at least not for the kind of error it’s giving me, the best I could hope for would still give an incorrect reading 90% of the time. DMC sells New Original Stock Voltage/Temperature Gauges, but there’s a good chance a replacement would also have calibration problems in a similar-but-different way, and I’m not sure this is worth $200 for that slight chance of improvement. So, I think I’ll just live with it. While I was in there, I gave all the connections a solid clean with electrical contact cleaner & also repaired a bad contact in the Lambda counter socket. This boosted the voltage gauge another tiny bit, now to around 13.4V, which I know represents around 14.2V. I also made sure all the main connector pins are sticking out far enough, since one or two of them had started to retreat. 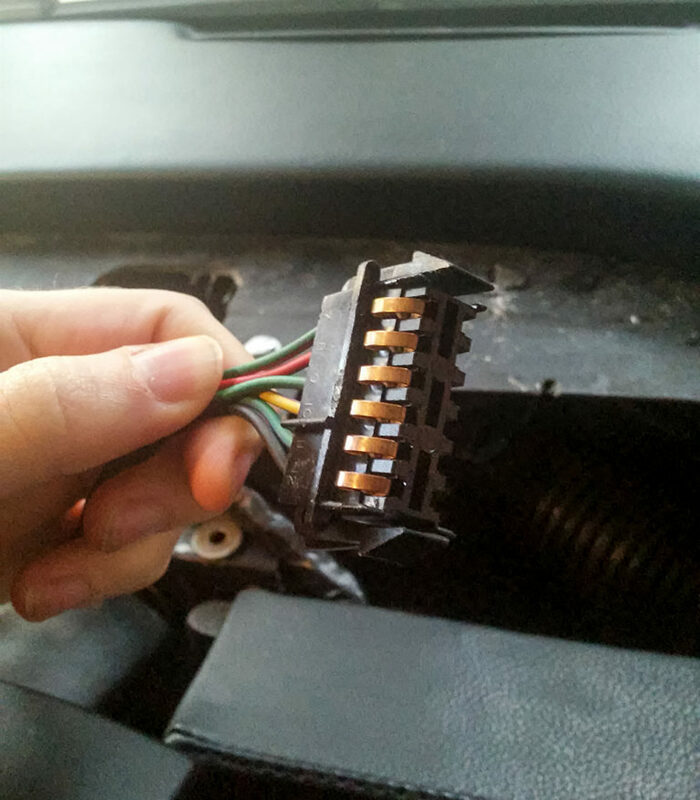 Speaking of, if anyone happens to know what these connectors are and where you can buy more… People are pretty sure they’re not DeLorean-specific, but as far as I’m aware no one in the DeLorean community has been able to positively identify them over the past 35 years. In fact this is one of the few parts people have tried to 3D print to replace because it’s so complicated and you really can’t make do without it. So there’s a challenge to you, dear readers! The main central connector to the back of the DeLorean dash instrument cluster, before I fixed the two semi-dodgy pins – no one knows what this connector is! 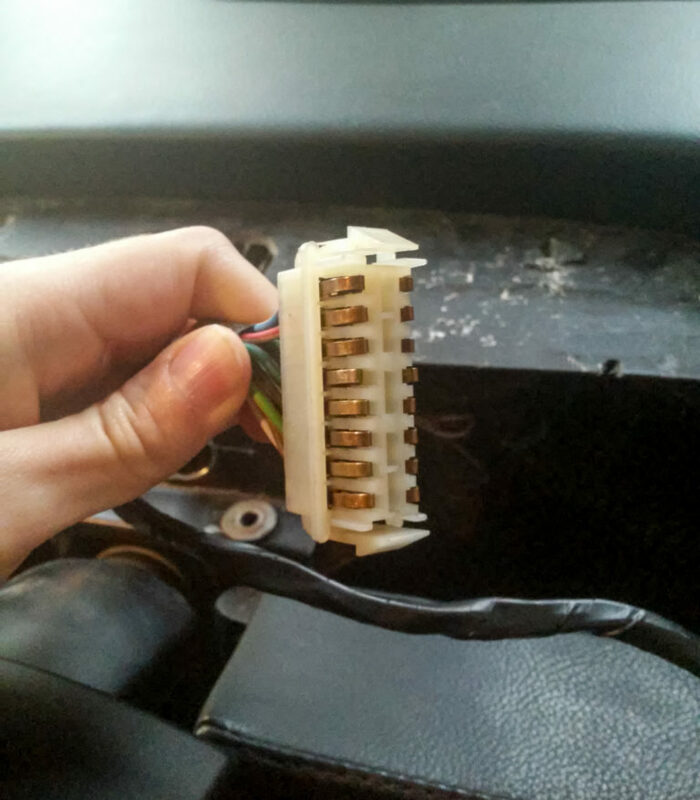 The secondary side connector to the back of the DeLorean dash instrument cluster – many people would be very interested if anyone could name these connectors & knows a source to buy some. If you recognise it, let me know!